I would not dare go used right now with the glut of burned up miner cards flooding the market. I wondered why prices for video cards seemed so crazy compared to other components. What is this "mining" exactly, and why does mining require high end video cards? Cryptomining, aka bitcoins. From what I can gather, GPUs are enticing because they are processors of their own independent of the CPU. That means that it's much cheaper than buying CPUs, but the end result is they shot the prices up through the roof by buying the lot of them and making them scarce. And boom, my 970 has died after 3 years and 4 months. I believe I’m going to go with a PNY 1060 xlr8 as the 1070s are just way too high priced. It was only a couple of months ago that my damn power supply blew. I’m cursed, I tell ya. Another consideration is heat/noise. More power use means a card that is going to run hot and therefore under load it'll be noisier. Some people want a quiet computer. Well crap, I had hoped the cryptomining price gouging had settled down, but apparently it's still going strong. It's fun to read amazon reviews from as recently as last spring talking about the 1060s being great cards for "under 250". Anyone have experience going from a 970 to a 1060? There's no way I'm spending 450 dollars minimum for a 1070. So that's off the table. Just curious if I'll suffer as a medium gamer (most of my gaming is console these days, but I do have a large steam library of strategy games and other stuff you can't play on a console). Yeah, which is why I was happy to just go with a 1050. And on that note, the order status has stayed at the "Dropshipper" stage for over a week now. I think I'll have to contact them. Anyone have experience going from a 970 to a 1060? According to UserBenchmark, 970 is comparable to the 3GB version, but slower than the 6GB version. Well, that lessens the blow a bit. Thanks. But man, this whole video card pricing debacle is really irritating. I'm going to bite the bullet and for 70 bucks more, get the 6 gigs and the two fans. A single fan on a video card gives me an irrational fear. I'm fairly certain that is a perfectly rational fear. If that helps. That reminds me, I need to double check to make sure it is the video card. I forgot test the monitor with another computer. I just tried a remote session, saw everything was running fine, and assumed it was the video card. Holy crap, bad hdmi cable. At least I believe so as it seems to be working after I replaced the cable. Whew, now I can hold off until the cards come down more (hopefully). Always troubleshoot the cheap stuff first. Rumor has it that if you buy a 1060 video card you may get a 1070. Also I saw where Walmart just had their GTX 1060s on sale for $209. NVIDIA’s highly anticipated GeForce GTX 1180 graphics cards based on the company’s upcoming Turing architecture will reportedly begin sampling on the 15th of June with on-shelf availability of Founder’s Edition models by July and custom built variants from NVIDIA’s AIB partners by August / September. 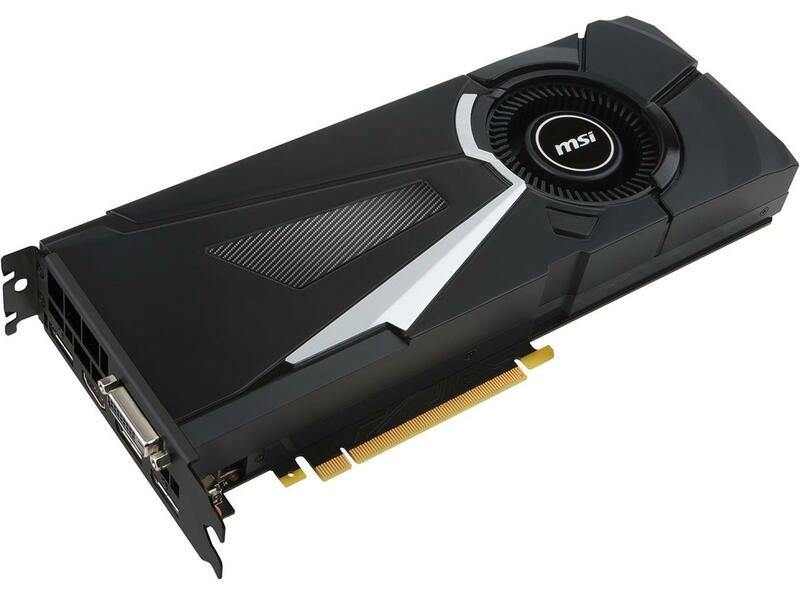 Last month we published specifications for the GTX 1180 based on various leaks, rumors and background industry chatter that we were made privy to at Wccftech. The green team’s new high-end offering is expected to deliver no less than GTX Titan Xp beating performance and 1.5x the frame crunching power of the GTX 1080. My card finally arrived. But it's a long story. After putting in that initial order, it had been sitting in 'drop-shipper' status for several months and not budging. I figured, I'm not gaming all that much this summer, so I'll wait and see what happens. This week, and several months later, I finally get a cancellation notification. Apparently they still let people order when things are not in stock? Hmmm. Well, a few days ago I put in a second order on a different card this time around and just got it today. That's not actually a long story, fyi, but congrats! GTX 1080 cards are getting cheaper. Below is the non sale price of a new 1080 and it comes wit ha $20 Steam voucher too it looks like. It looks like the next Nvidia card will be the RTX 2080, launching next week. I'm planning to build a new rig this year and was looking forward to the new generation of Nvidia cards. Now I'm dubious. I love the idea of raytracing, and the side-by-side comparison screenshots are impressive. But it seems like RT could easily become this generation's HairWorks -- a new technology that makes things look prettier, but tanks framerates. I'll wait for some benchmarks from reliable sites before deciding what to do. Well, the good news is that this should hopefully bring down the price of last-gen's prices. The new card prices are just silly..over $1000 for some of them. Leaving aside flops like Hairworks or physics cards, what I've noticed over the years is there is a time gap between 'new tech available' and 'new tech being used in games to any significant degree'. So let's say a new version of Directx comes out. It will be years before that version has any major impact. If you're a game developer, why would you make your games for DXwhatever, when the majority of your potential customer base is still using previous gen videocards? But then, after all that time passes and games start coming out to take advantage of the new tech, those cards that were the first generation to support that tech are now old and too slow. Now if you want to enjoy those games that are using that tech you'll need to buy a contemporary card. Which leads me to believe this first batch of RTX cards are for people who get their kicks being early adopters. This first batch won't have any real point other than that. I suspect game support will be spotty and tacked on, and performance inconsistent, which will cause most people to just play it with ray tracing off. At this point, the ones buying up cards for cryptocurrency generation could still end up buying the cheaper cards leaving buyers having to pony up for the more expensive ones, and if that's the case, we're kind of back to square-one. Well, that's great news! But it's interesting how NVIDIA seemed to actually encourage it as part of their expected profits to begin with and letting it guide them. That seems kind of sleazy of them. I think the hope was for the 2080 to play current games at 4k/60fps with max settings. If it can't then it will probably be seen as a big disappointment. With nVidia focusing on the new tech and not the performance gains is a bit worrying, although they do claim the 2080 will be 50% faster. I'm looking forward to seeing the real world benchmarks. I dont have a care in the world for 4k. Then again video cards are too big and too expensive anyways so moot to me. I'm playing with the idea of getting a GTX1080 to replace my 970. Just not sure if the prices are going to fall more with the new gear releasing. I have no doubt that in 4k these new cards will outperform the old cards. The question is "In which games?". I might be the exception, but when I upgrade my videocard it's because I can no longer run the new games. I don't upgrade my videocard so I can play a game from two or three years ago. I think most people who want to buy one of these new cards want it to play Shadow of the Tomb Raider in 4k, not Rise of the Tomb Raider. They want it to play Battlefield V in 4k, not Battlefield 1. So the new cards might be more powerful in non RTX mode, but the games will also be more demanding. I'm in the same boat - i have a 970 and a 1440p monitor. It struggles with some games and it's time to think about replacing it. I'm leaning toward either a GTX1080 if I can find one on sale or wait for the inevitable GTX2060. My understanding is that only the 2070 and 2080 will be RTX branded with ray-tracing - but also that the RTX2080 is unable to maintain 60 FPS at 1080p in Battlefield V with ray-tracing enabled. I don't see the point in paying for an RTX card if it's going to perform so poorly with ray-tracing that I never turn it on. A lot will depend on pricing for the 2060. Actually, I think that's the most common most conventional way. I'll use a videocard until It stops working and where an upgrade becomes a necessity. Until then, any new games is very much a luxury. I'm in no hurry to play the very latest. Those who must absolutely have the latest and greatest every few years are a niche. And as for these new top of the line cards, I'm left to think that these will mostly be bought by those who are competitive. And those who are professionally competitive will likely end up being getting sponsored equipment anyway. Everything I have read in the year leading up to this is that the 1070ti is damn close to the 1080 in performance, but costs significantly less. "Significantly" may not be quite as significant if prices drop across the board due to the new cards. But my point is, after considering your price options, a 1080ti would be a better choice than the plain 1080, or go with the 1070ti. Also, do you have a link for that discussion about the RTX2080 and BF V? I am interested in knowing more.